Let us begin with a picture of loveliness. How can you not love this crow? And yet, something lurks above, threatening this bird's freedom to roam. Earlier this summer, I heard shrieks coming from an overgrown area of the farm. It was a hawk hatchling, crying for its mother to bring it food. This went on for a couple of weeks. And then one day there were two hawks in the sky, one smaller than the other. That's when the problem started. They want to eat my crows. How dare they?! In case you're just tuning in, I feed crows. They're so smart, I can't help myself. They're almost like people. Anyway, I didn't realize how bad the situation had gotten until one day I did what I always do: headed out with a bag of seeds and peanuts and called "Crow!" As always, the crows headed for my voice. They'll do anything for peanuts, the food of the gods. I looked up and saw a few crows in the sky, heading toward me -- and right above them were two hawks. It was almost a crowtastrophe! The crows realized they were threatened, freaked and flew away. No one was hurt. The sad part is that for days afterward, they thought I was in cahoots with the hawks. I was like, "Me?! Me?! The guy who feeds you daily?!" But crows are suspicious. They can't help it, it's their nature. So I had to rework my whole routine. The hawks had learned that me screaming "Crow!" meant delicious crows were on the way. Shortly afterward, one of the crows -- the one in the photo, I think -- talked to me from the tree in front of my house. 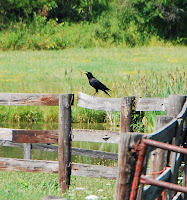 He spoke to me in the soft voice, the one crows reserve for friends. 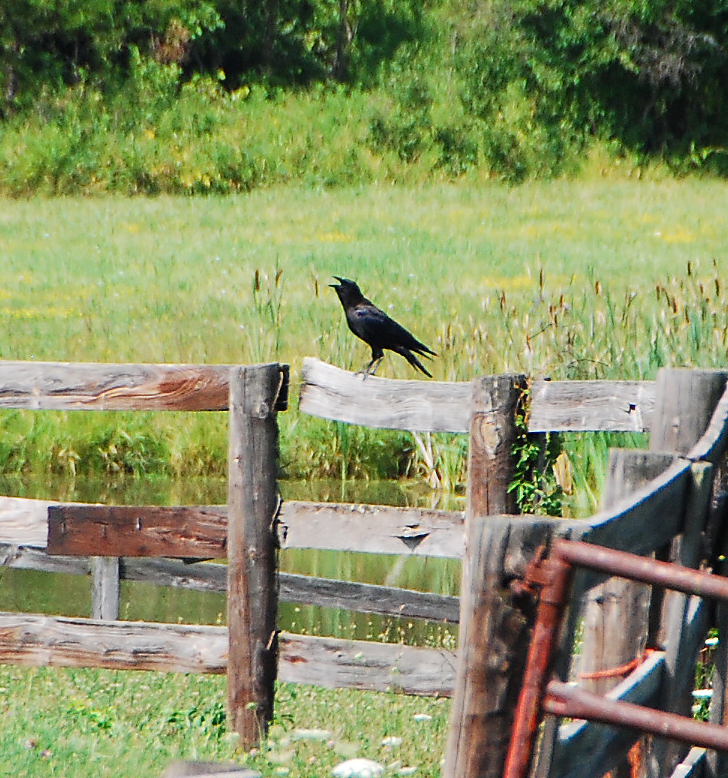 It's not the ugly cawing sound; it's very pretty. He was trying to tell me something. Meanwhile, construction workers saw me seemingly talking to the air and asked who I was talking to. 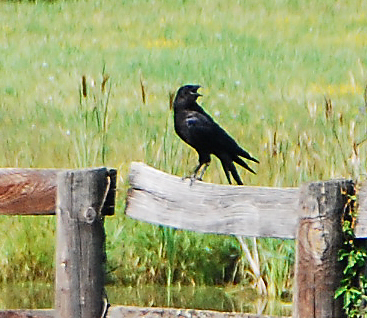 I said, "a crow". They just shook their heads in pity and looked away. But I thought I understood the crow's message. I knew what he wanted me to do. He wanted me to be silent. So now I feed the crows without calling them. I just head out, they see me, and they come. No hawks at all. Mind you, they're still there. But they've discovered another food source: wild turkeys. I saw them swooping down on a group of 10 or so unfortunate hens. Jeepers. But at least it wasn't my crows. This has been your slice of crow/farm life. I hope you enjoyed it. As for me, I gotta go feed the crows. And you can bet I'll be silent as I do it. One more view of Crow. Ain't he fine?